After years of reduced fat efforts, an ever increasing challenge for manufacturers of Ready-to-drink beverages has been the inclusion of fat and other healthy oils. An increasing number of teas, coffees and similar beverages are including ingredients like MCT oil, vegetable oils or butter fat to develop new, never-before-seen beverages. While consumers enjoy these new trends and innovations, product developers are struggling with the stress that these ingredients place on the stability of the beverage; specifically when it comes to emulsification. Emulsification refers to the successful mixing of multiple (normally unmixable) ingredients together. Soda, ice cream and salad dressing are emulsion examples that we enjoy every day. 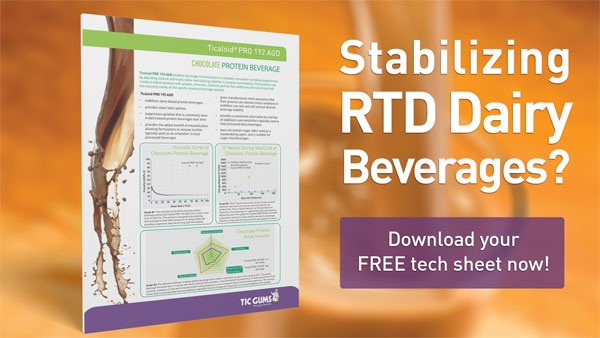 And with RTD beverages in particular, emulsification is vital for both stability and a successful shelf-life. So to achieve the required stability, product developers need an emulsifier. But, a single ingredient emulsifier will likely do little to maintain the appropriate texture. That’s where a gum system comes in to play. A gum system can help address multiple beverage concerns at the same time. Our systems are blends of multiple gums which work in tandem to address issues like emulsification and texture. For example, Ticaloid Pro 181 AG is a gum system that emulsifies and modifies the texture in RTD beverages. When used in dairy-alternative beverages (like almond-milk), the system will emulsify the residual oils from the almonds while enhancing mouthfeel providing consumers with their preferred drinking experience. Ticaloid Pro 192 AGD provides stability for dairy-based beverages, even when they include high protein and healthy fats. Despite increased levels of these ingredients, this gum system prevents separation and decreases awareness of particulates. So don’t struggle any longer with poor emulsification and texture. Talk with a Gum Guru to get started today! Call our technical support hotline +1-800-899-3953 / +1-410-273-7300 or chat live online.